We're covering a lot of news this issue, so some important items got moved to Worth Reading because of space limitations. But be sure to look at them too! What's Going On With Broadband in the UK? "HERO EXPERIMENTS" - 400Gbs over 12,000km! Q&A: What you are asking the FOA? It's now CFOT® and Fiber U® The FOA CFOT® (Certified Fiber Optic Technician) and Fiber U® (the FOA online self-study program) are now a registered trademark. 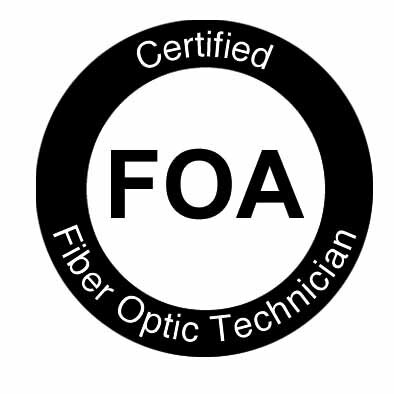 With over 33,000 fiber optic techs holding CFOTs and the CFOT being recognized worldwide as the foremost certification in fiber optics, the FOA realized the value of the CFOT and Fiber U required trademark protection. Now it's official! Want to know more about fiber optics? Free Self-Study Program on "Fiber U®." Looking for specific information? Study for FOA certifications? 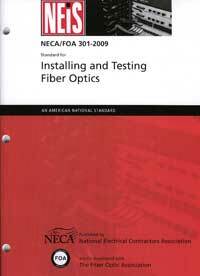 Here's the largest technical reference on the web: The FOA Online Fiber Optic Reference Guide. Renew your FOA certification online - plus get a discount on the new FOA books and an extra month free. Details here. FOA will be exhibiting at FiberFest in Boston, Monday June 3, and FOA President Jim Hayes will present a seminar on OLANs. More info on FiberFest. FOA is also supporting the M2M Technology Forum in Abu Dhabi on 17-20 June 2013. This conference focuses on "machine to machine" communications for automation and control, especially in the energy arena. FOA representatives will be presenting a seminar on fiber for M2M. More info on FiberFest and M2M below. Google Fiber Expands to Olathe, KS, Austin, TX, maybe Provo, UT. Google Fiber must be considered successful by the company, since they have announced in the last month that they are expanding their Kansas City service area to Olathe, a city of 125,000 residents 20 miles SW of KC, adding the city of Austin, Texas and have made an offer to take over the struggling municipal network in Provo, UT, iProvo. In addition, Google is crating a free pubic WiFi network in the Chelsea neighborhood of New York City where it has its headquarters for the city. All this is good news for fiber optics, even the public WiFi, as those antennas depend on fiber for their Gb connections too. Olathe is a no-brainer, since it is a population center one short fiber run from KC. Austin should arguably been the first city to build Google Fiber. It's a hotbed of techie and activists who vow to "Keep Austin Weird" as the T-shirts say. With SXSW festivals and UT's active university community, it should be perfect to show what proper Internet connectivity can do. We have lots of contacts there (including an iOS developer in the family) and can vouch for the enthusiasm of the locals for Google's decision to build there. As expected, local Internet providers AT&T and Time Warner Cable responded with a "we can do that too!" And "The city of Austin has offered Google its rapid cooperation and that of Austin Energy in the development and construction of the Google Fiber project. Google isn’t asking for financial incentives from the city, but it is getting access to city utility poles and city rights-of-way. That sort of response from incumbent communications carriers, industry experts said, might have been part of what Google was aiming for with its project." One must wonder about AT&T commitment in Austin or elsewhere, however. AT&T has avoided FTTH commitments like Verizon with FiOS in their areas. At the same time they are asking for regulatory changes before they offer Gb home connections in Austin, they are now offering customers with landlines cellular wireless adapters (AT&T Wireless Home Phone) to encourage them to drop landlines and go all-cellular, with the adapters connecting into their current wired home phones. One assumes AT&T intends for these customers if they now have DSL would either switch to cellular (hopefully 4G or LTE) for Internet access or give them up to CATV cable modem connections. Seeking a contract MDU Field Manager to join the Google Fiber rollout team in Kansas City. 10 years of experience with fiber network deployments, including experience with constructing new outside and inside plant fiber infrastructure, and 5 years of experience with MDU infrastructure. Posted on LinkedIn until April 30. 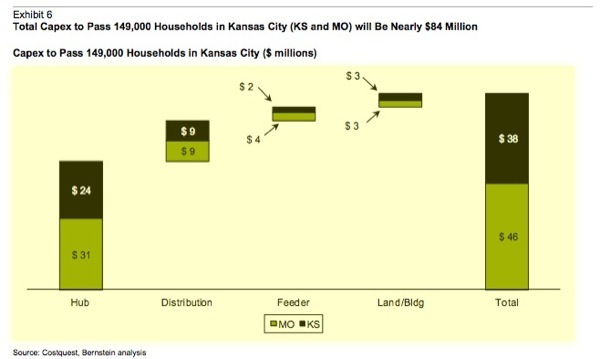 Here is what they estimate it costs Google to build the KC network to pass all the served neighborhoods. 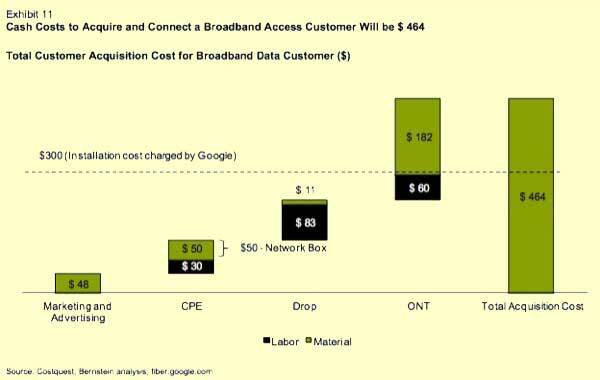 Here is what they estimate it costs Google to connect a broadband-only customer. Look closely at the costs. At the home, the ONT is only $182 plus $60 labor. The drop only $11 plus $82 labor. That's pretty cheap! 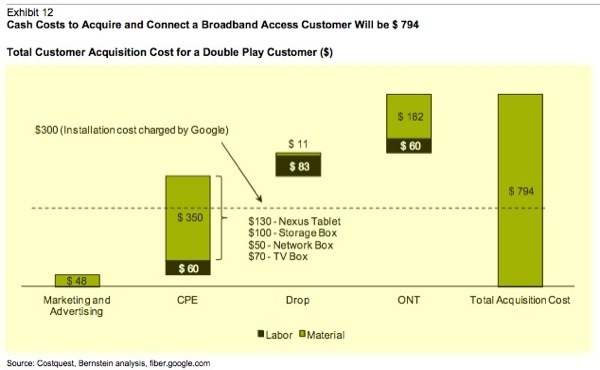 Here is what they estimate it costs Google to connect a triple-play customer. Here the additional costs are for the extra hardware provided to the consumer including a DVR and a tablet controller, making it a higher level of equipment than most FTTH systems. Rumors of the cost impact of China's plans to build FTTH to hundreds of millions of subscribers include a cost reduction of the ONT to ~1/3 of today's costs, which could have a big impact in the costs of FTTH installations. This information should be useful to those contemplating building FTTH systems, especially those municipal and utility groups that are outside the geographic areas of interest of the traditional comms companies. Another issue is if it only costs this much to connect a user, how many service calls does it take to cost-justify FTTH? Read the Business Insider article here and do not miss their summary at the end. So-net Entertainment began offering its “Nuro” fiber-based 2Gb/s service on 15 April 2013 to homes, apartments, and small businesses in Tokyo and six surrounding prefectures. Nuro will cost ¥4,980 (US$51) per month on a two-year contract, plus a ¥52,500 (US$537) installation fee that it is currently offering for free for those that apply online. The upload speed is 1Gbps. Read more. The Australian Financial Review reports that NBN CEO Mike Quigley said the main reasons for delay in the rollout of the national broadband network was lack of available workers. Last week Mr Quigley announced a 44 per cent reduction in the forecast number of homes NBN Co plans to pass by June 30, leading to a three-month delay in the overall rollout. He attributed much of the slowdown to construction companies being ­unable to provide the workers required to build the network quickly enough. Over the last several years, FOA has several times offered to share with NBN what we've learned from working with FTTH providers in the last 7 years, beginning with assisting Verizon recruit schools and instructors to teach adequate numbers of workers to do FiOS installs and continuing to today with many other systems around the world. We've offered our CFOT and CFOS/H curriculum, experience in training instructors and the enormous experience and wisdom of our local contact, Trevor Conquest of Conquest Communications, to assist them. So to Mike Quigley and all you NBN people, the FOA publicly offers its assistance again. Lots, actually! BT has a web page with the news. Consumers should stop using this product unless otherwise instructed. It is illegal to resell or attempt to resell a recalled consumer product. That's straight from the US Consumer Product Safety Commission. It should be a warning to distributors selling cheap, imported cable which is usually marked as "UL Approved" but it's really just counterfeit! 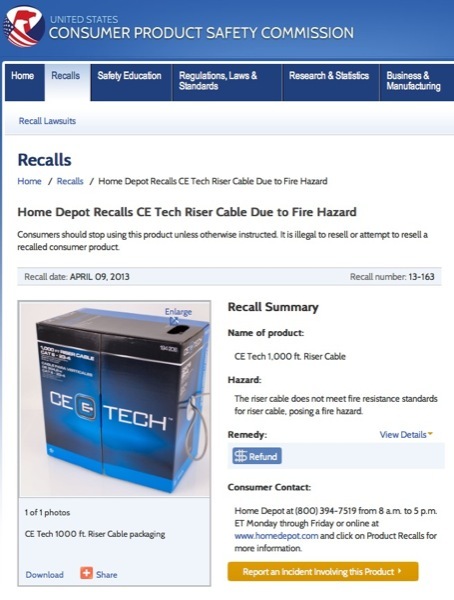 This recall probably cost Home Depot several million dollars. What Should We Make Of This? "Apple Recommends For Super high-speed, error-free data transmission. This CS Electronics 10G-rated Fiber Optic Cable with Small Form-Factor LC connectors with latching connector system offers enhanced transmission performance, size, and durability. Duplex cable in 50/125 micron fiber for Fibre Channel, Gigabit Ethernet, and a multitude of fiber optic-based protocols. Meets OM3 transmission standards. Backward compatible with OM1 and OM2 fiber products (2G and 4G)." So is there an Apple product coming that uses fiber optics? Yes - gigabit 850nm VCSEL transceivers for $7.50US! So how much more expensive is fiber than copper? That's Why They Are Called "HERO EXPERIMENTS" - 400Gbs over 12,000km! Researchers at AT&T have devised a way to increase the distance that large amounts of data can travel through a fiber-optic connection. The technique should allow 400-gigabit-per-second signals to travel for a distance of 12,000 kilometers—four times the previous distance possible—and it promises faster ocean-crossing transmission without adding more equipment. The feat is like sending 170 HD movies 12,000 kilometers—half-again as far as the distance from San Francisco to Tokyo. MIT Technology Review. Splicing new drops for Verizon FiOS service. The idea that saboteurs in wetsuits would dive to the bottom of the Mediterranean Sea and cut a fiber optic cable, though not impossible, is highly unlikely, if only because doing so would be a good way to wind up dead. “These cables are carrying thousands of volts of power,” Mark Simpson, CEO of SEACOM, told Wired. But undersea cables are vulnerable. Read more in this WIRED article. And, hey Wired, get with it - wire is obsolete. You should be called "Fibered"! IGI has a new report out "Another Telecom Network BUST? 2000 All Over Again?" "The industry is rapidly moving from wireline based to wireless. However, wireline continues to provide the infrastructure for the entirety. Wireline revenue, which supports wireline investment, which is the infrastructure for wireless, is falling substantially. The new Advanced Architecture services (FiOS and Uverse) are great successes, in terms of total impact, but they are not enough to stop the erosion of wireline revenues. What’s more, it appears that these services are growing at a much slower rate, and in fact are in decline. In the late 1990s and early 2000s telecoms all over the world were building network capacity to meet a traffic growth that didn’t materialize (at least not until a decade later.) Normally responsible executives were proclaiming that the network was growing at 400% a year (!) and capacity was being built to that projection. Nothing grows at 400% for long, and the network certainly didn’t. The telecoms borrowed money to build for income that never came; they used fraudulent accounting schemes to hide the true costs of their mis-endeavors; equipment vendors loaned telecoms more than the value of their purchases in order to get business. These abuses led to many bankruptcies and great losses on the stock market. World-leading vendors and telecoms went down – either in bankruptcy or by being sold to other companies at pennies on the dollar. In addition, a large over-capacity position was created in the network market place. The telecom bust was said to be ten times more painful than the dot.com bust that occurred more for less simultaneously. Perhaps George Gilder, the renowned futurist and technologist, was partially responsible for this Telecom Bust. He predicted in 2001 that there would be a trillion dollar telecom market. He was partially right, because there were extensive drivers of added traffic on the network. However, there was one problem, the telecoms couldn’t devise a way to charge for the traffic being generated on the network, and that same problem persists today. Now, over a decade later, that excess capacity has been abandoned, obsoleted, or more than used up. Telecoms have long since begun building new capacity – much more cautiously this time, using new technology – DWDM and ROADMs largely. Traffic now is growing continuously (at 40%, not 400% a year) but capacity is growing much slower due to the caution from the bitter 2000 experience, and due to the worldwide recession. This combination could be leading to a reversal of the 2000 situation, but potentially just as dangerous – a new telecom BUST created by poor service on what are now very critical telecom links resulting from under capacity. In this day of everything going wireless, it is important to separate access from network. Wireless is an access service, as is FiOS, Uverse, POTS, etc. They all use the wireline network to interconnect. Investment in wireline supports the network carriage of all access traffic, including wireless. Therefore, when we say that the traffic on the network is increasing by 40% a year, we are talking about traffic on the wireline network, regardless of its access point. Capital investment (a redundant phrase) is the “Supply” side of the demand – supply relationship in network economics. Actually, the supply side is cumulative investment plus ongoing capital investment, but we are only going to deal with the going forward issues. If capital investment is not keeping up with growth as in the introductory chart of this section, then the ongoing traffic growth will overtake the capacity and all of the disastrous things previously delineated will happen to the network – slow responses, server shutdowns, etc. Both these statistics are excellent incentives to system operators considering a FTTH system. Download and read the report here. Community and business leaders looking to secure their economic future through ultra high-speed Internet connectivity now have a convenient online resource to assist them in upgrading local networks to all-fiber, as the Fiber to the Home (FTTH) Council Americas recently launched its Online Community Toolkit. The Toolkit offers an array of templates, white papers, case studies and other features that are designed to assist civic leaders, local telecommunications providers and other groups finance, plan and build all-fiber networks that are capable of delivering gigabit speeds and beyond. A community toolkit for building ultra high speed networks. The FTTH Council Americas is holding this special conference in Kansas City at The Westin Crown Center to provide communities with the Toolkit they need to deploy gigabit networks. Hear from those on the frontlines of the gigabit revolution—public and private sector leaders who have brought (or are bringing) ultra-high speed broadband to their communities. Through general sessions and interactive workshops, we will showcase the tools to get gigabit deployed, including an understanding of the value proposition of gigabit networks and how to create an asset inventory, aggregate demand, issue an RFP, and manage implementation. At the OFC show this year, Arrayed Fiberoptics showed a new option for singlemode fiber optic connectors, a non-contact (air gap) connector based on APC ferrules. The fiber is undercut slightly to ensure the fibers do not touch, then the optical surfaces are coated with an anti-reflection coating to reduce reflectance. Versions are available to match current PC and APC connector stypes: NC, No Contact and ANC: Angled, No Contact. Insertion loss is similar to regular connectors and reflectance depends on the mating connector for regular PC connectors but is comparable to APC connectors. Being non-contact, the connectors avoid the wear from the physical contact of regular connectors so they can last through many more matings which could make them useful for testing, depending on the correllation with other mated connections. There is a presentation online that gives more infomation and data on these connectors. Lennie Lightwave was the cartoon character mascot of the original "Fiber U" in 1993. A short book called "Lennie Lightwave's Guide To Fiber Optics" became the way most people got started in fiber optics with the distribution of 60,000 printed copies and Lennie becoming one of the first commercial websites. Lennie is still on the web at http://lennielightwave.com, fully updated to today's technology and just as popular! Now Lennie is available as a FREE iBook on Apple's iTunes store. If you have an iPad, you can go to the iTunes store, choose "Books" and search for "Lennie Lightwave" to get your free copy. FOA, working with Cabling Installation and Maintenance magazine, presented our third webinar for them- this time on OLANs. The webinar covered the history of cabling for LANs and look at the evolution of cabling for today's high speed networks. Over the last couple of years, we've written a lot about all-optical LANs, either based on FTTH passive optical network (PON) or point-to-point (P2P) Ethernet architecture. The more we see of these types of networks, the more we appreciate their design and economy. But how about scale - how big can they get? In November, we ran a picture story about the new San Diego Central Library which is using a Tellabs optical LAN using PON technology that was using about 1000 4 port drops. Now we hear another Tellabs customer has over 16,000 users. That must make it one of the biggest LANs in the world. Here are more sources of information on optical LANs - BTW, they need a name - let's start calling them OLANs! In our continuing quest to help people understand how to test fiber optic cable plants and communications systems, we've created two more "QuickStart Guides to Fiber Optic Testing." 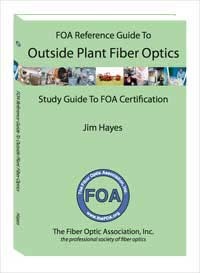 They are simple, step-by-step guides on how to test fiber optic cable plants, patchcords or single cables using insertion loss or OTDR techniques and optical power from transceivers. It's as straightforward as it can get - what equipment do you need, what are the procedures for testing, options in implementing the test, measurement errors and documenting the results. It can't get much simpler. Send anybody you know who needs to know about fiber optic testing here to learn how it's done in a few minutes. We've added lectures on new topics, the characterization of optical fibers for CD, PMD and spectral attenuation, important issues for long haul systems and DWDM, POF and OLANs..
A new section of the FOA YouTube channel is all about teaching fiber optics and premises cabling. It's designed to help instructors working toward FOA CFOS/I instructor certification but is also useful to anyone teaching fiber or premises cabling. Last year we ran monthly features on OTDRs to try to increase user awareness of the proper way to use these instruments. We hope we made some progress. Calibration of OTDRs is a messy issue. There are many variables. You can purchase OTDR calibration artifacts for calibrating your OTDR but as far as I know, they are generally not traceable to national standards labs. Using fibers to calibrate an OTDR introduces errors. Let me elaborate. Two parameters of the OTDR need calibration: dB and length. Calibration of the dB scale, used for measuring loss and attenuation coefficient (which is also dependent on length calibration) is complicated by the way the instrument is used. For loss, the measurement is very low in magnitude (~0.1dB) but fine in resolution (as low as 0.001dB), so nonlinearities on a small scale along the entire measurement range are the issue. Proper calibration would include the linearity of the entire measurement range which is virtually unknown. For attenuation coefficient, the dB measurement is over a longer range and can be done with a calibrated artifact. But that calibration is wavelength dependent. For length, it's a matter of time measurement in the OTDR - distance is calibrated from the index of refraction of the fiber or the group velocity of the test pulse in the fiber. This can be done with a calibration artifact - a fiber of known length and index of refraction - but again the calibration is wavelength sensitive. You can get calibration artifacts from NPL in the UK, but you need to know the calibration wavelength of your OTDR and the characteristics of their artifact to make corrections. Another method uses a electronic calibrator - take the pulse from the OTDR and trigger a delayed return pulse to calibrate the distance scale and a optical ramp to simulate the attenuation of a fiber. This removes the unknowns associated with using a fiber and has been championed by many scientific types. Any OTDR manufacturers want to offer their wisdom? You may already know that the FOA has a free OTDR Simulator you can download from our website (go here for directions) that allows you to practice using an OTDR on your PC, seeing the effects of changing setup parameters and analyzing dozens of real world traces. But here are two more tools that can be good for practice. 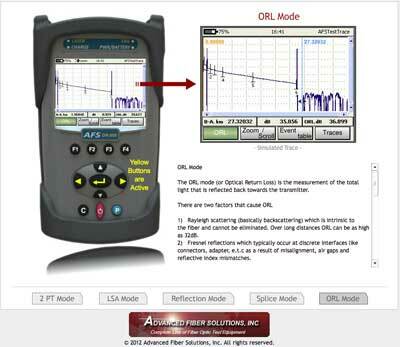 AFS has an online interactive demo of their new OTDR that allows you to see how an OTDR makes measurements. You use the yellow buttons in the center of the OTDR to set the markers to make measurements. Very well done. Go to http://www.afsi.us/otdr/otdr_mode.php for the demo. Fiberizer OTDR App Available Free as "Cloud Service"
Fiberizer Cloud – fiber optic testing data management solution in the cloud. A version of the Fiberizer app for iOS devices. OptiXsoft and Agizer are glad to introduce Fiberizer Cloud for fiber optic data management and analysis. On the one hand being tiny companies OptiXsoft and Agizer have solid experience in fiber optic test equipment and software development and now offer the Fiberizer App for iPhones and iPads. The new web service Fiberizer Cloud was developed from the view point of ordinary fiber optic engineers and their businesses. Now engineers have no need to store multiple copies of their OTDR traces on different PCs in tremendous number of nested folders; or to order expensive custom software. Fiberizer Cloud allows to store and analyze fiber optic testing data directly from the browser opened on desktop PC or notebook (iOS and Android mobile clients are coming soon too) connected to the internet wherever they are. Fiberizer is a iPhone/iPad APP that reads industry-standard ".sor" format files and allows trace analysis on your iPhone or iPad. An android version is in the works too. Read more about Fiberizer. And here are more directions on its use. Including FOA Master Instructor Terry O'Malley's tests on what the end of a fiber trace looks like with broken and cleaved fibers. Community Toolkit Conference - If You Are Going, Meet FOA - Jim and Karen will be there! FOA is supporting the M2M Technology Forum in Abu Dhabi on 17-20 June 2013. This conference focuses on "machine to machine" communications for automation and control, especially in the energy arena. Representing the FOA, Ganesan Kandaswamy and Cliff Walker will present a paper on "The Role of Fiber Optics in Communications and Information and Control." FOA presented a special webinar with Cabling Installation and Maintenance Magazine on "5 Ways To Test Installed Fiber Optic Cabling." This webcast seminar, produced by Cabling Installation & Maintenance and presented by FOA President Jim Hayes, takes a hands-on look at each of these five standard test methods. Attendees will see the physical setup of each method and gain a thorough understanding of each method’s application as well as measurement uncertainty. You can watch this seminar on your PC or Apple iPad or iPhone. This webcast seminar was presented by FOA President Jim Hayes. In the seminar, Hayes will explain what is involved in a cabling-installation project (fiber, copper and/or wireless), from concept to acceptance. He will describe the step-by-step procedures, referencing which responsibilities fall on the end user, which fall on the contractor, and the critical points of cooperation between the two. 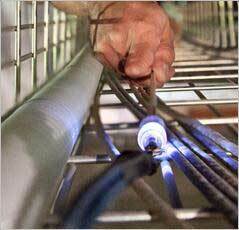 The seminar is archived on the Cabling Installation & Maintenance Website. Corning Cable Systems' See the Light team is coming to a city near you! Receive Free fiber optic training on a variety of topics including Termination Technology, Testing and Trouble Shooting, Fusion Splicing, and Preterminated Solutions. These interactive three-hour sessions provide students with a comprehensive overview of the latest technology. Fiber optic BICSI (CEC) credits apply (3). Here is the current information and schedule. You are invited to join JDSU for a complimentary series of educational webinars. Each webinar, presented by a JDSU subject matter expert, lasts approximately one hour, including Q&A. Go here to see the seminars offered. Search for "fiber" IMPORTANT: use registration password: FONA1. Don't forget to download your copies of the JDSU Testing Textbooks. Read more about them here. And above. Go to the FOA "1 Page Standards"
All FOA Certifications have now been recognized by the US Department of Labor. The DoL reviews certifications and how they relate to job opportunities and training. The DoL Career OneStop website helps individuals explore career opportunities to make informed employment and education choices. The Web site features user-friendly occupation and industry information, salary data, career videos, education resources, self-assessment tools, career exploration assistance, and other resources that support talent development in today's fast-paced global marketplace. US Department of Labor Recognizes FOA In New "Occupational Outlook Handbook"
FOA is listed in the new US Department of Labor "Occupational Outlook Handbook" in the section "How to Become a Line Installer or Repairer." This website lists all sorts of interesting information, including what these workers do in their jobs, how they get trained and certified (where the FOA is referenced) and something everybody is interested in - sections on "Pay" and "Job Outlook" - see the red arrow above. FOA has started a new LinkedIn group called "Fiber Optic Training" dedicated to discussions on fiber optic training. Anyone can join our new Linked In fiber optic training group. We're experimenting on teaching instructor-led online courses on LinkedIn - watch for announcements on the FOA LinkedIn group and Fiber Optic Training Group. Take a look and join the group. FOA is now offering corporate memberships to companies involved in fiber optics as manufacturers, contractors, installers, etc. Among other benefits, Corporate Membership gives companies access to special FOA materials for educating customers and employees. Read more. FOA has joined the American National Standards Institute (ANSI) to be able to keep up to date on more standards activities. FOA now offers free standards for testing the installed fiber optic cable plant, patchcords and cable, optical power from transmitters or at receivers and OTDR testing. Look for the "1 PageStandard" web page and in the FOA Online Reference Guide. Because of its importance to users, contractors and installers of fiber optic networks, The FOA and NECA have agreed to make the NECA/FOA 301 Fiber Optic Installation Standard available free to FOA members. It's specifically written to be used in contracts to define "installation in a neat and workmanlike manner." FOA members can go here for instructions on how to download your free copy. There are two new free online self-study programs on Fiber U. Fiber Optic Network Design is for those interested in learning more about how ot design fiber optic networks or studying for the CFOS/D certification. FTTx is for those wanting to know more about fiber to the "x" - curb, home, wireless, etc. - or studying for the CFOS/H certification. Got to Fiber U for more information. We are considering using these self-study courses as part of online instructor-led courses using Linked-In. We have a new LinkedIn group, "Fiber Optic Training" (see below) which will be used for this. Join now for these courses. We have created three new FOA books to be used in training for FOA certifications and as reference books for contractors, installers and end users of fiber optics. These books have full curriculum support, including free curriculum materials for teaching FOA certification courses. Because we are self-publishing these books using more modern "publish on demand" technology, they are easier to keep up to date, easier to buy and much, MUCH cheaper! All are now available in print and electronically in Kindle and Apple iBook versions. The basic fiber optic book is also available as a self-study program in an Apple APP for iPad/iPhone/iPod. Details on the new book each of the new books are at the book pages linked to the photos above. 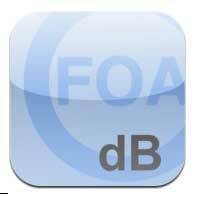 The FOA has just released its second APP for the iPad, a free "loss budget calculator," FOA LossCalc. 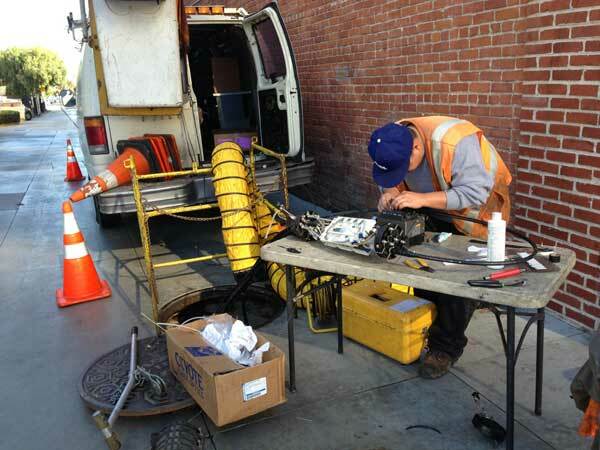 FOA LossCalc estimates the optical loss of a fiber optic link. This will save time for the installer of a fiber optic link needing to know whether test results are reasonable and/or make a "pass/fail" determination. It can also help the designer of a link to determine if communications equipment will operate over this link. Our first app is a self-study version of the FOA Reference Guide to Fiber Optics. The FOA APP builds on the FOA basic fiber optic textbook to create an interactive learning environment that builds on the iBook electronic version of the book to add a guide to use for self-study and real-time testing that provides feedback on what you have learned and correct answers to questions answered incorrectly. The FOA APP is priced at only $9.99, same as the iBook, so the self-study program is free. Download it from the Apple APP Store with your iPad or iTunes. Standards cover components and systems and how to test them, but rarely get into installation issues. The FOA NECA 301 standard which covers installation of optical fiber systems has been revised for the second time, adding considerable new materials. This standard is derived from FOA educational material put in standards form and approved by ANSI as an American National Standard. It's specifically written to be used in contracts to define "installation in a neat and workmanlike manner." The standard is available from NECA. FOA members can go here for instructions on how to download your free copy. 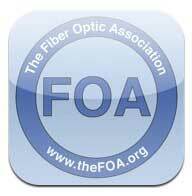 The FOA has many videos on YouTube, including Lecture Series on Fiber Optics and Premises Cabling, Hands-On lectures on both and some other informational and instructional videos. For all the videos, go to the FOA Channel "thefoainc" or use the direct links below. We've added lectures on new topics, the characterization of optical fibers for CD, PMD and spectral attenuation, important issues for long haul systems and DWDM, POF and OLANs. 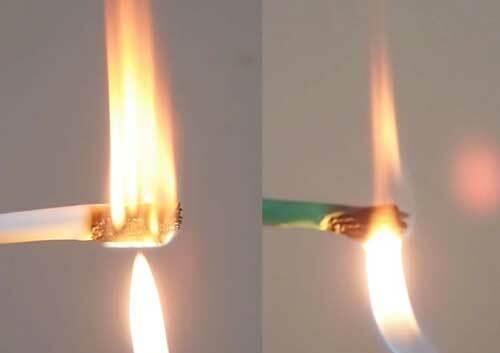 We also added a Premises Cabling lecture on counterfeit Cat 5 cable, with a demonstration of its flammability. You may have read the stories we have written about the counterfeit "Cat 5" cable made from copper-clad aluminum rather than pure copper. Recently we tried an unscientific burn test on the cable compared to a known good UL tested cable and posted a video on YouTube. You can see the results below. Below is a list of all the current lectures (plus there are 28 hands-on videos too!). We're looking for ideas for topics for future lectures. Send your ideas to <info@thefoa.org>. FOA Lecture 24 Copper, Fiber or Wireless? The FOA has added more videos to our YouTube Channel, thefoainc. 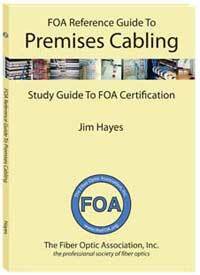 These are an introduction to premises cabling, covering applications, types of cabling, standards and installation practices for copper (UTP and coax), fiber and wireless. Like our lecture series on fiber optics, these provide a comprehensive introduction to the subject in short videos, typically 5-10 minutes in length, on each subject. Watch for more. Premises Cabling Lecture 1: What Is Premises Cabling? View all the FOA YouTube video Lectures. We have been updating the Online Reference Guide to keep up with changes in the industry and adding lots of new pages of technical information. When we talk about FTTH, we often assume we are installing the fiber to a “home” where it terminates in a optical line terminal (OLT) and services (voice, data and video) are delivered inside the subscriber’s "home." But since we may have detached single-family homes, row houses or living units in a large building, the situations can be quite different, requiring different architectures and installation practices. To clarify the options for fiber in MDUs, FOA has created a new page in our FTTx section of the FOA Guide to explain the options. OLANs: Optical LANs - based on FTTH technology and offering speed and economy for most premises applications. As we developed the new Fiber U self-study courses, we updated the FTTx and Design pages and added a FTTx installation section. More and more installers are being asked for OTDR testing but using these instruments is not easy. They are hard to set up properly and complicated to interpret the traces. Using the autotest function can lead to disastrous results! The FOA has a good tutorial on OTDRs on our Online Reference Guide and we added a free download of an OTDR simulator to the OTDR section so you can learn how to use an OTDR on your PC. Links to manufacturers and distributors of fiber optic lighting products. The FOA Online Fiber Optic Reference Guide has become very popular - perhaps the most popular technical website ever, typically with over 360,000 users downloading about 1.75 million pages in 2011! We continue updating materials regularly, keeping it as up to date as possible. There's so much information on the FOA Tech Topics and Online Fiber Optic Reference Guide that even a well-organized Table of Contents isn't enough and when the material is always changing, an index is impossible to maintain. So the FOA is using the latest technology in search, Google Custom Search, which will allow you to search just the FOA Tech Topics and Online Fiber Optic Reference Guide for any topic you want to find more about. Try it! 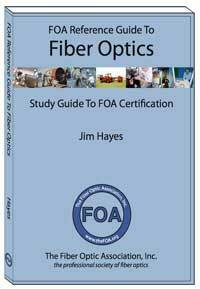 Go to The FOA Online Fiber Optic Reference Guide. Quote from one of our certified instructors: I want to thank you and your organization for all the resources you provide for the students and the opportunity to offer the certification to the students. The fact that you published the book yourself to get the cost down and the unlimited free resources on your website shows a commitment to the public that is second to none. I let it be known to the students that the FOA is the best in the industry at supplying knowledge and resources related to the communication industry. I look forward to passing on the information that you provide for the industry. BDI Datalynk trains at the Unversity of Central Florida. UCF created this incredible video on the BDI Datalynk program. It shows the power of what we offer in our campuses around the US. Find a listing of all the FOA-Approved schools here. Most phone calls we get regarding finding a FOA-Approved training organization want to know two things: what school is closest to me or what school offers the certifications I need. 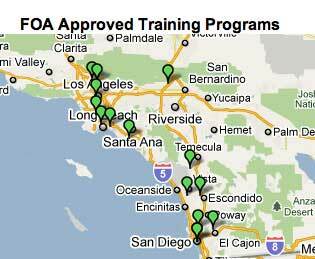 That can be difficult, since the FOA has almost 200 training organizations we have approved worldwide! We've been looking at ways to make it easier, and we think we've got a good solution. In fact we have two solutions. First we have added a sortable table of all the FOA-Approved schools. You can also use our FOA Google Map Application to find FOA-Approved schools. Here are links to the sortable table of all the FOA-Approved schools and FOA Google Map. What Should A Fiber Optics or Cabling Tech Know and What Skills Do They Need? The FOA has been updating its lists of KSAs (Knowledge, Skills, Abilities) for fiber and cabling techs. The updated list is now on the website for your information and comments - as fiber and cabling KSAs evolve as new technologies develop. KSAs for fiber and cabling techs. Tech Hint: Did You Know You Have A Fiber Optic Tester In Your Pocket? Yes! That old mobile phone has a camera which may be sensitive to infrared light - lots more than your eye - and can detect light in an optical fiber or from a transmitter. Chris Hillyer,CFOT/CFOS/I, Master Instructor, Northern California Sound & Communication JATC sent us some photos showing how this works. See below or the video now on YouTube. Update: You should check out your old cell phones before you recycle them. We've found older models use sensors which are better at infrared than the newer ones which take better pictures. This is a good use for your old cell phones hiding in the drawer! Q: When should a contractor test with an OTDR? The contract states that they shall follow all TIA best practices. The contractor is aruging that the OLTS is good enough. Is there any test that is an OTDR can do that is a standard that a OLTS not do, like ORL? A: There are really two issues: Is OTDR testing appropriate and is it going to give useful information? OTDR testing is useful to verify splice loss on concatenated OSP cables, find events with high reflectance or find faults or points of stress induced during installation. OTDR testing is not useful on most premises applications because the cables are too short to be resolved, connector loss has high uncertainty unless measurements are made in each direction and averaged, and even the old argument that it finds stress loss points from bad installation is moot since most Fiber used in premises installation is bend-insensitive variety (MM & SM) and it won't show stress loss anyway! OTDR manufacturers have gotten creative about what OTDRs can do to sell more units, but that doesn't change the reality of what the instrument can do. And the study used to get them approved for "certification testing" was only valid for 10G OM3/4 fiber with less loss than 2 dB-not all installations. BTW, there is another issue. Cost! OTDR testing is expensive testing - especially if you do not get useful info. Something else relevant, from the wisdom of a company I worked for in the IC automatic test business. 1. Testing costs $ so never perform a test unless there is a valid reason for it. 3. Always understand the uncertainty of the measurement so you know the "error bands" and have means to evaluate whether something is good or bad if it falls inside those bands. Failing a good part is as wrong as passing a bad one. This is why experts complain so bitterly about the "pass/fail" testing advocated by some OTDR manufacturers. Q: I am trying to find either a regulation or guidance document on the minimum depth fiber optic cable should be installed. A: This is a question we get often - the answer is "depends." Some local ordinances will specify the depth of buried cables, but many cities have no regulations. Generally, cables are buried ~3 feet deep, although in some areas (South Africa, for example), a depth of 1.5m (almost 5') is required since that is lower than most automated trenching machines and will help prevent accidental digups. In cities, it's necessary to work around current infrastructure. In farmland, direct buried cable is sometimes plowed in at ~3'. Microtrenching is becoming popular in cities (see the FOA newsletter for a story about it in Toronto: http://www.thefoa.org/foanl-10-11.html) and that cuts a groove 8-12" below the road surface to bury smaller cables and ducts. Sometimes, with fiber to the home (FTTH), the cable is buried at a lesser depth (12-18") in the customers yard, but we've already heard of these cables being cut by the homeowner! RUS has a construction document that may be of interest. Q: We have some optical extender boxes for digital video transmission. I would like to know how to calculate the maximum distances we can achieve using different data rates and different types of multimode fibers. I know the power optical budget we have, its: 8dB. We use CWDM VCSEL lasers. So from this I can calculate the total attenuation adding the insertion loss and fiber loss. This gives a maximum distance. However there’s an other property called the bandwidth of the fiber, [MHz*km] which is different for OM1, OM2, OM3 and OM4 fibers. How do I calculate that? A: There are two answers to your question - choose the one that gives the most conservative answer! 1. Use the fiber specification for bandwidth to calculate the distance. Since you are using a VCSEL, the chromatic dispersion is low so modal dispersion dominates. There is a table at http://www.thefoa.org/tech/ref/basic/fiber.html in the middle of the page that shows the bandwidth of the various MM fibers (OM1-4). To calculate length, let's say you need 100MHz bandwidth. An OM2 fiber has 500MHz-km bandwidth so it would be limited to ~5km on bandwidth, but of course it would have over 15dB loss, so bandwidth is not an issue if you have 8dB limits. 2. Compare it to other digital networks. http://www.thefoa.org/tech/Linkspec.htm has a list of networks and their allowed link lengths on various fibers. Pick one that is similar in bit rate to your network. So 10/100Base-SX which uses LEDs and suffers both chromatic and modal dispersion, is limited to 300m on any fiber (chromatic dispersion is a big limiting factor on LED systems). But 1000Base-SX uses VCSELs at 850nm and the link length is variable with fiber bandwidth. 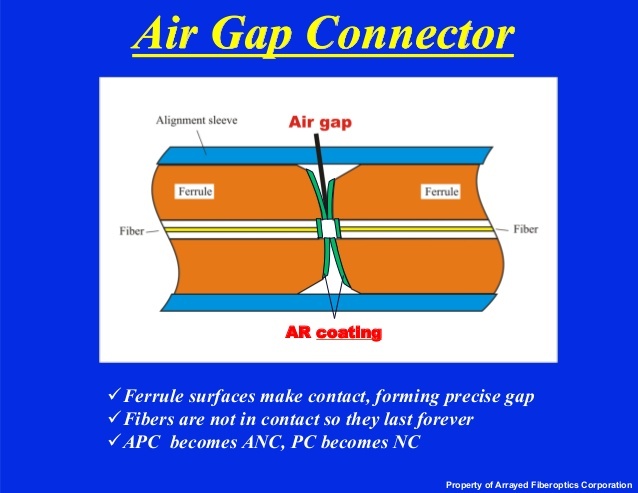 Q: I now know that a rubber polishing pad produces a PC connector, a glass pad produces an air gap connector and that air gap connectors avoid fibre damage caused by ferule rotation when mating connectors. When fitting ST connectors, am I correct in assuming that they always be polished with a glass pad to produce an air gap finish? And following this logic, SC and LC connectors would always be fitted using a PC finish? A: ST connectors were one of the first connectors to be keyed so the ferrules would not rotate in mating and therefore could be a contact connection. In fact they were spring loaded to ensure contact. At first they were polished flat but then the soft polish and ferrules molded with a convex end were introduced to produce PC finishes with lower loss and reflectance. So STs, SCs, LCs or any connector with a ceramic ferrule should be polished on a rubber pad - 80 durometer rubber is the spec. Q: I have a question. I have three SM fiber runs between 300 and 550 feet. connectors on both ends, and we are testing with an OTDR with launch reel. I am getting around .03 at 1310, but I am getting .18 to .23 at 1550. Why would i get a higher loss at 1550 then 1310. I feel that it has to do with the distance and wavelength at 1550. A: Sounds like some stress on the fibers. At 1550, fiber is extremely sensitive to bending/stress losses compared to 1310. Look for tight bends in the cable or even stress at the connectors. Check them with a visual fault locator and look for light in the cable just behind the connector. An interesting exchange occurred recently on LinkedIn regarding damage to fiber optic connectors used in DWDM systems with fiber amplifiers. It's something not often mentioned but could be an issue in many systems. Q: We are facing a problem that mainly occurred when we tried to introduce a high power 21dBm EDFA in our network for 64 split in our FTTH network. The problem is that it damages connectors and patch cords very quickly. Is it recommended to swich off the equipment before patching and unpatching? We find it difficult to implement becuase once some ports of the EDFA are used, there are running customers on those ports and we cannot power OFF the equipment again and again. Is there any other solution to safely patch and unpatch ot equipments with such high powers or we have to switch it OFF anyway? A: I was one of the first in the USA to be trained ( in early 1990s) on EDFA OP-AMPs. You must turn-off the TX (laser/amp) prior to disconnecting the connector. If you do not you will hear a "snap" when disconnecting the connector. This is the laser reflecting back and forth between connector faces. The core of the fiber will melt down burning the core black. 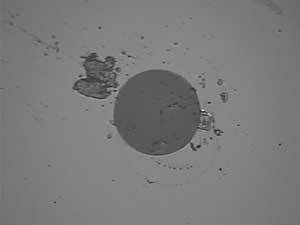 ( check with the equipment off and with a microscope) You will see a black tunneled out core. You will have to replace the connector in the equipment as well as the jumper you disconnected. Please use all safety practices here as this can blind a person if you have active equipment while testing! This has always been a problem with high power in fiber networks as the core of the fiber is so small the power density is extremely high. The light out of the fiber is high enough to be harmful to eyes too! Turn the system off before patching! Q: Can an SFP optical transceiver be used in place of a light source to test link attenuation? A: Certainly a system source can be used to test attenuation. You just need a means to turn it on and have it stay on for the duration of the test. Attach a launch cable or patchcord to it, measure the output of that patchcord with a power meter and use as the "0 dB" reference. Connect it to the cable plant, attach a patchcord to the other end and measure the power output - the same output that would be coupled to the receiver. The difference in the two power levels is the loss. In fact, you measure the actual loss the cable plant will see in operation. About the only time we would not recommend this is a DWDM system or AM CATV ssytem with a high power laser and/or fiber amplifier as the power levels are high enough to be dangerous, to the connectors as well as the equipment and test personnel! Q: If I set my OTDR to measure distance in kilofeet or miles, does the OTDR still display fiber attenuation in dB/km? A: Yes, it seems most OTDRs will report the fiber attenuation coefficient in dB/km even when you measure distance in other units. Q: I’m hoping someone can point me in the direction of a technical paper on micro trenching. Q: How many modes can travel down a multimode fiber at the same time. A: It's something one can calculate based on the core index profile, diameter and wavelength of the light. 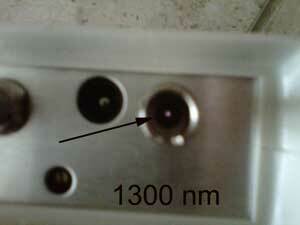 A typical multimode fiber at 850nm carries hundreds of modes, a single mode fiber at 1310nm carries one. But you can see the effects in two FOA YouTube videos. FOA Lecture 22: Mode Power Distribution in Multimode Fibers Demonstration shows many modes in multimode fiber using the same 650nm laser. 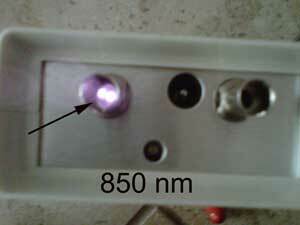 At higher wavelengths like 850nm, there are many more modes than shown here. Q: We have a customer building a Data Center. The customer will be using OM3 Fiber optic for backbone an there will be 2 diverse paths. Now the customer is asking to provide 2 different colors of OM3 cable and same 2 colors of patch cord on OM3. Is it correct to use different colored cables other than the standard aqua for OM3 fiber? A: Yes, it is OK to use different colors of cables to identify cables in diverse paths. The "standard" color for OM3/OM4 cables, aqua, is a recommendation but it's not uncommon in large enterprise networks and data centers to see lots of different cable colors. Q: We are trying to troubleshoot a fiber cable by using a flashlight pointed in one end and seeing if it comes out the other end...(I know a bit low tech but..) The distance seems to be too great to get the light of the flashlight to come through. What tool out there can help with this issue? Q: I was wondering if the FOA might think about adding a feature to the FOA website… Like a technical discussion forum… or other member forums for discussion. A: We use LinkedIn for those kinds of technical conversations. We have a CFOT group and a Fiber Optic Training group that are pretty active. Anyone can join the FOA Fiber Optic Training Group or join the FOA Group if you are a CFOT. Q: Is there a coupler on the market to hybrid SM and MM to avoid high dB loss in that even? A: No! Several people have tried to make tapered fibers to mate different fiber sizes but none successfully. You need electronics to do it. Q: These days fiber cable is not simply 62.5um or 50um - we now have 3 different grades of 50um fiber......ie. OM2, OM3, OM4. How important for cables to be matched for this? A: The difference between OM2/3/4 fiber is the structure of the core used to increase the bandwidth. Since all these fibers are designed to have the same core diameter and NA, doing insertion loss tests with mixed types is not a problem. However, many of these laser-optimized fibers are not made as "bend-insensitive fibers and mixing those fibers with regular fibers can be a problem. Q. How do I test cables with expanded-beam connectors? A. Since most meters have smaller detectors they may not capture all the light from these connectors, so a 3-cable reference with a known good cable of the type under test is probably the best method to use. See here and here in the FOA Guide. Q: In our FTTH build-out we have changed a large number of customers from copper to fiber. There is a huge amount of copper underground lying free. (Inside ducts) The issue is that in the access network most are together with new fiber cables (no sub-ducts). In the primary routes there are large count copper, say 2000 pairs and above too. So pulling out wont be easy and need to be done by a specialized party. There is a large amount of money down below! I hope you can give me some guidance and refer me to the right company or the right person to get an idea. A: Yes at the current price of copper this is indeed a very profitable "mining" venture! A web search for "removing copper cables from underground ducts" gives lots of leads, but the company I remember talking to is "Cable-X" http://cable-x.net/what-is.htm which is based in the Netherlands. Q: We have a project we are working on and I had a few questions: The project is a large indoor mall. The mall wants to add public WiFi. Would FTTO work for this application? A: This is an ideal application for FTTO. You would use singlemode fiber and would need to add power at the antenna locations for the wireless access point and a media converter or switch. One advantage is flexibility of placement of APs in a large facility with direct connections to just one equipment room. 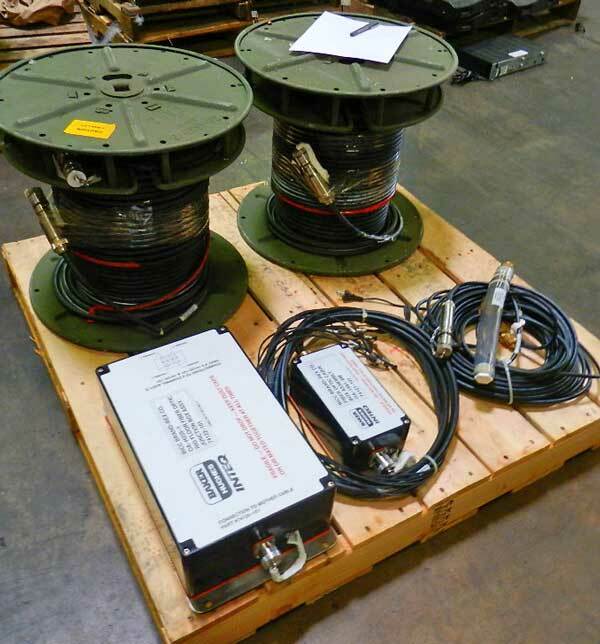 I would look at prefab cable assemblies too- you might be able to avoid field termination or splicing. Q: Something new came up in a discussion with a network engineer. He told me about “mode conditioning patch cables”. What are they? A: They were originally used for Gigabit Ethernet at 1300 nm using laser sources. 1000Base-LX sources were lasers with singlemode pigtails. Multimode fibers of the era were notorious for having incomplete fusion of the glass in the center of the core which caused bandwidth problems. Mating a SM pigtail laser to one of these fibers caused big bandwidth problems since they launched right into the center dip. The immediate solution was to set up an offset launch to avoid the center of the fiber with LX sources. 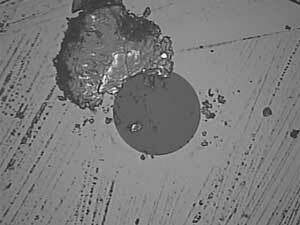 VCSELS had problems with these fibers too, even though they launched a much larger spot, so the laser-optimized 50/125 OM3 fibers were developed to not have the center dip and OM4 followed soon thereafter. 10GBASE-LX4 had the same problem, of course, only worse, with OM1/2 fibers and SM lasers. The patchcords are usually made by splicing SM to MM fibers with an offset of ~10 microns. I cannot say I know anyone who has actually used them! 1300 nm has no advantage with MM fiber as the bandwidth has been optimized for 850nm. And they are much more expensive than 850nm VCSELs. It is unlikely you need them with OM3/4 fiber and I would not recommend running 10G over OM1/2 without some field trials. From a contrator in the Middle East: Here some samples of the connectors for SM fiber already installed in the system we were testing. As you can see, the dirt is large compared to the size of the fiber (dark gray), and the core (not visible here) is only 9/125 of the overall diameter of the fiber! More on cleaning. See Product News below for links to vendors of fiber cleaning products. See news about Fiber Optic Cleaning Videos on YouTube by ITW Chemtronics below. Measurement Uncertainty: Everyone testing fiber optics should understand that every measurement has some uncertainty - whether you are measuring loss, length, wavelength, power, etc. Knowing that uncertainty is very important to interpreting the measurement. It's worthwhile to read and understand the issue of measurement accuracy covered in this page of the FOA Online Fiber Optic Reference Guide. The gigabit future is going to bring about an Internet that is at least three times faster than anything available today, and that could be good news for innovators everywhere. This goes well beyond being able to stream more movies, download more music and play more games. Technology innovators could fully realize entirely new uses for a faster Internet — ideas that are only in their infancy today, impacting areas ranging from health care and infrastructure to online learning. Washington Post. CNS magazine in Canada's March/April 2013 issue has a good overview article. Read more. The risks associated with major IT projects are being vastly underestimated, according to the largest study of global IT projects ever undertaken. Scary stuff, but good background for IT managers. MIT Technology Review. Cabling Installation & Maintenance on cabling nightmares. Comic or tragic, depending on your point of view. FOA President Jim Hayes is interviewed by Howard Baldwin for the CISCO BLOG on the issues of installing fiber optic cable and how to "think creatively." Read the blog. FOA Director Bill Graham makes the case for epoxy/polish connectors in this article in Cabling Installation & Maintenance Magazine. 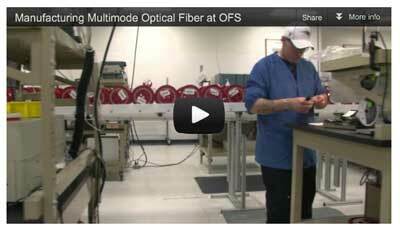 OFS invites you on a tour of their multimode fiber manufacturing facilities in this new 5-minute video. You will see their highly automated manufacturing operation in Sturbridge, Mass., including their patented MCVD preform fabrication process to fiber draw and final product testing. With a technological heritage dating back to AT&T and Bell Labs, OFS has been manufacturing high-quality multimode fiber since 1981. Where Are The Jobs In Fiber Optics? The August, 2012 FOA Newsletter presented a review of where we see the most active areas in fiber optics now and where the jobs seem to be most available. You can read this article here. If you are looking for a job, the FOA also has a web page on looking for jobs and a LinkedIn group for CFOTs where jobs can be posted,plus a jobs section in this newsletter. At our seminars in the UAE with eSharp Consultancy, Cliff Walker presented information on his work designing "fiber to the office (FTTO) networks. The concept is based on using fiber to connect large switches in the equipment room to smaller switches with 4 ports at the outlet. You can read Cliff's paper on the airport system to see estimates of the cost savings using FTTO. Read Cliff Walkers paper on FTTO. Craig Bowden, FOA Master Instructor at FiberNexxt in NH, presented a program at the New England Fiberoptic Council recently on fiber in wind power. His presentation is available for downloading here. It's full of good illustrations and photos that tell the story. The G.657 standard was developed by the International Telecommunications Union (ITU) to provide consistency in the evolving requirements for bend-insensitive single-mode fiber.This OFS paper sums up the standard and what it means. Read more. BrightSource’s 370-megawatt facility near Las Vegas is taking shape, with lots of fiber optics being installed by FOA-certified techs..
Want To Know Where Submarine Fiber Optic Cables Run? There is a good map online by TeleGeography you can access here. An interesting article from ADC on the differences in APC and UPC connectors makes the choice easier. Read more. You are not the only one! As Bob Metcalfe, co-inventor of Ethernet, once said at a conference "The wonderful thing about standards is we have so many to choose from!" But the Siemon Company, an active participant in standards activities for decades, has tried to give some order to this chaos with a new website Standards Informant where they cover the TIA, ISO /IEC and IEEE standards that affect cabling and networks. If you need to keep up with standards, sign up for their email newsletter too. We've been asked many times "How long does it take to splice a cable?" It's not a simple answer as it varies with the number of fibers in the cable and the work setup, including whether one or two techs are working at a job site. FOA Master Instructor Joe Botha of Triple Play in South Africa did his own analysis based on decades of experience both splicing cables and teaching others how to do it properly. This is one of the best analyses we have seen because Joe includes prep times as well as splicing times and differentiates between one tech and two techs working together. He adds some other tips on fusion splicing too. This should be mandatory reading for every tech and given to every student! Here is Joe's splicing analysis. Joe also has an excellent writeup on how to choose singlemode fiber that helps understanding the different types of G.6xx fiber. Read it here. And you will want to read Joe's report on splicing different types of SM fiber, including bend-insensitive (G.657) fiber. Read it here. Videos on Firestopping: These free videos from UL and the International Firestop Council are good tutorials on firestopping. Go here to view the videos. Nano-Trench offers products for micro (or I guess they call it nano-) trenching and their website is very informative. They also have Kabel-X, a method of extracting copper cables from old conduit. Both websites are informative and interesting. Watch this video on the cable removal process! Mike Holt is the acknowledged expert of the US National Electrical Code (NEC). His books and seminars are highly praised for their ability to make a very complicated standard (that is in fact Code - law - in most areas of the US) easily understood. Part of the appeal is Mike's great drawings that make understanding so much easier. Mike makes Chapter 8 of his book available free. It covers communications cables, telephones, LANs, CATV and CCTV, for premises applications. Even if you live in a region or country where the NEC is not the law, you may find this interesting. Pearson Technologies Inc., a 32-year fiber optic training, technical and marketing consulting firm, announces availability of a free training and certification tool. This tool is a free set of crossword puzzles on the terms of fiber optic installation and products. This set assists those studying fiber optic installation or planning to take the Fiber Optic Association (FOA) Certified Fiber Optic Technician (CFOT) certification examination. The four puzzles are for: light and fiber terms, cable terms, connector and splice terms, optoelectronics and testing terms. The puzzles can be viewed and printed from: http://www.ptnowire.com/resources.htm or http://www.ptnowire.com/CFOT-Puzzles-vb.pdf. Individuals can receive the answers by email request. For additional information, contact Pearson Technologies Inc. at: 4671 Hickory Bend Drive, Acworth, GA 30102, at (770) 490-991, or via e-mail at fiberguru@ptnowire.com. 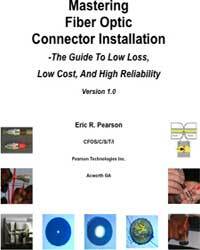 A new book from Eric Pearson, Mastering Fiber Optic Network Design, has just been introduced (9/12). 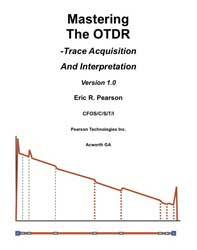 Pearson Technologies Inc. announces the release of four new books, Mastering Fiber Optic Network Design, Professional Fiber Optic Installation, The Essentials For Success, Mastering Fiber Optic Connector Installation and Mastering The OTDR. Based on 32 years of experience, laboratory testing, development, and training of more than 8000 installers, these books is suitable for training, installation, personnel certification, and reference. Eric's books are perhaps best described as fiber optic "cookbooks," full of detailed directions that reflect many years of tesing in his courses. They are valuable references for the fiber optic tech. ITW Chemtronics has three fiber optic cleaning videos on covering Dry Cleaning, Wet-Dry Method, FiberWash and Combination Cleaning. They are good explanations of cleaning processes - the Wet-Dry is especially interesting. 15 minutes of a rarely-seen BBC documentary demolish the myth that ARPAnet was inspired by nuclear war, and explain the far more intriguing truth. We've had numerous requests to reprint our guidelines on safety when working with fiber optics, so we have created a "Safety Poster" for you to print and post in your classroom, worksite, etc. We suggest giving a copy to every student and installer. Corning now offers videos on . Lots of interesting videos, some technical, some sales, but all good information. US Conec's videos on cleaning fibers - show's the results of proper cleaning. Lots of interesting webinars, mostly on FTTH. Go here. FOA President Jim Hayes presents an overview of fiber optic testing for all applications. Available on Demand. Sign up here. The second volume of the JDSU series on fiber optic testing has been published. Volume 1 focused on Basic Fiber testing and Volume 2 is geared toward fiber optic installers, project managers, telecom technicians and engineers who need to understand fiber networks. Volume 2 also covers Chromatic Dispersion, Polarization Mode Dispersion, Attenuation Profile and Fiber Link and Network Characterization. A 3rd volume, a glossary of fiber optic terms, is also available for download. This is a "MUST HAVE" for all fiber optic techs. Download your free copies here. We used this book as one of our references in creating a new page in the FOA Online Reference Guide on chromatic dispersion (CD) and polarization-mode dispersion (PMD). Careers in Fiber Optics: Brian Smith. 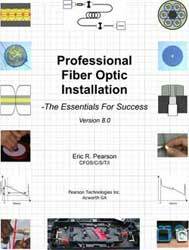 A 1998 book on fiber optic jobs is a bit dated, but a free overview is on Google Books and worth a look at it online. As much as 70% of the problems associated with deploying fiber to the home result from something as simple as dirty connectors according to JDSU. Telephony Online. American Polywater (http://www.polywater.com/) has one of the best technical website for cable installers. Here is a rundown on some new material on their site. Cable Installation using "Push" or "Push/Pull"
" Heard on the Street" is a monthly online newsletter from Frank Bisbee of Communications Planning Corporation that covers the telecommunications and cabling businesses. Each month includes news from manufacturers, trade associations and professional societies like the FOA. You can read the current issue and back issues online. JDSU has announced the See the Light webinar series, a four-part program designed for anyone involved in the installation, maintenance, and repair of fiber optic systems. It begins with fiber inspection and cleaning and then covers the basics of fiber testing. The webinar series then continues with the more advanced optical time-domain reflectometer (OTDR) and fiber local area network (LAN) testing challenges. More information on the series. IGI is offering a series of webinars on topics of interest to those in the communications industry. You can join them live ir download from the archives. IGI WEBINAR ARCHIVES UP AND RUNNING - VISIT TELECOMBRIEFINGS.COM TO DOWNLOAD! IGI, a major market research and technology reporting company (the "Active Optical Cables" below) is offering a a free one year subscription to one of our fiber optics newsletters to FOA members. All they have to do is to send IGI an e-mail stating which newsletter they would like to get. See http://www.igigroup.com/nl.html for a listing of IGI Newsletters. Yes! The camera in your cell phone is sensitive to infrared light - lots more than your eye - and can detect light in an optical fiber or from a transmitter. Chris Hillyer,CFOT/CFOS/I, Master Instructor, Northern California Sound & Communication JATC brought this to our attention. If you have an old cell phone, try it too. Our experience is that older cell phone cameras have better sensitivity at IR wavelengths than newer phones, so you may want to toss that old phone into the toolbox. How do you design and manufacture fiber optic systems? Choose and install one to serve your communications needs? Troubleshoot problems? The FOA Fiber Optic Technical Bulletins will provide step-by-step guidelines to help you. All are PDF files you can download, print and use. 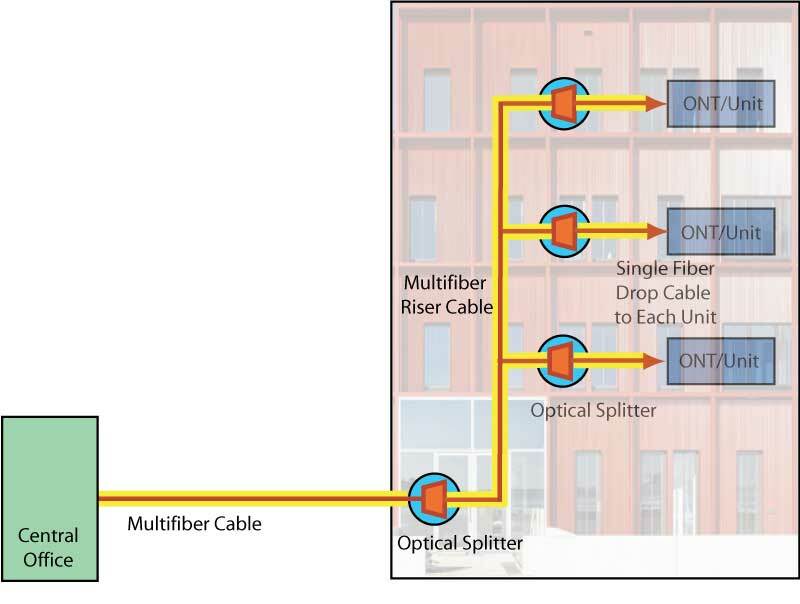 Are there really 5 different ways to test optical fiber cabling after installation? Why so many? How do the measurements - and more importantly the measurement results - differ? What are the advanteages and disadvantages of each method? Why are there 4 ways (maybe 5) to test fiber optic cables? Do OTDRs and OLTS tests give the same results? Updated link specs for fiber optic networks - now includes 10/40/100G Ethernet. AFL and Excalibur Engineering announced a new leasing program featuring NOYES® fiber optic test equipment. Products include the NOYES M310 Data Center OTDR, the FLX380 High Performance Micro OTDR and the C880 Optical Loss Test Set. All leased products are supported with a three-year warranty and calibration plan. Leasing information and quotes are available via the Excalibur Engineering online leasing storefront. Visit the AFL product pages at www.excaliburengineering.com/Rent-or-Buy-AFL-Noyes. Patch panels are often a mess, with cables running in all directions causing - at least after some moves, adds and changes - a big mess. TE Connectivity (AMP to us old-timers) is now offering a new 1.2mm cable design for patchcords that can help reduce the mess. The 1.2mm patch cord requires half the physical space needed for small form factor 1.6-mm patchcords, one-third of the space needed for commonly-used 2.0-mm patchcords, and is up to 3 times the strength of these larger diameter cables. Available with singlemode SC and LC connectors, the 1.2mm cable enables higher equipment densities in smaller space, while reducing capital and operating expenditures. Compare the size of the cable to the size of the LC connector above. It's hardly larger than typical 900 micron tight buffer fiber! One reason this cable is possible is the use of bend-insensitive fiber - reduced bend radius fiber as TEC calls it. We're seeing more BI fiber in premises applications because it allows smaller, more rugged cables that are easier to install. OFS has started supplying BI-SMF with a 200 micron coating instead of 250 microns. This means they can make smaller cables or higher density cables, ideal for FTTH and OLANs. Like the TEC cables above, smaller cables are easier to handle, especially in high density environments. Here are photos of a system for sale in Houston. It could be a ruggedized field unit for seismic research. AFL’s broad selection of cleaning products enables engineers and technicians to choose the products that match their current and future needs, and also comply with established cleaning procedures. These products are designed for ease-of-use in a wide variety of environments. More. Cleerline Technology Group, an offshoot of D’Addario & Company, Inc. (yes, the people who make guitar strings, among other things), is offering a new type of fiber. They have a proprietary, patented coating technology that allows the tech to strip off the buffer coating with a fingernail when connectorizing in the field. Watch their YouTube Video to see how it works. Illuminated Fishtape: Why Didn't I Think Of That? Klein Tools, (http://www.kleintools.com/) for professionals since 1857, introduces a new illuminated fish rod tip (Cat. No. 56119). The bright white, omni-directional light illuminates when fishing above ceilings, in attics, through walls, in crawl spaces and under raised floors. The hook or bullet nose attachments (sold separately) fit smoothly into the threaded top and the ends are tapered for easier pushing and pulling. Advanced Fiber Solutions has introduced a new compact portable OTDR that offers high resolution (to 1m) and light weight (1.6 pounds, 0.72 kg) plus numerous wavelength and range options. Here is more information. Pedestals and underground vaults can be damaged by rodents who come up through the base and damage cables. Uraseal "Drain N'Seal" foam deters mice from taking up residence in your pedestals. They have some good videos on using their product. Have you read the FOA Tech Topics on Cleaning? One of the better sites to track FTTx projects is this Google maps application that shows projects on a world map with details on the project. Click on the map above or here to view the interactive web map. Want To Learn More About FTTx? The FOA has created a special FTTx resources section of our website with a FTTx links page with lots of links to news, market reports, technical articles and vendor technical and product information. Here is a great place to start learning more about FTTx. Read the Broadband Properties article about the FOA FTTx certification program. Read the article about FOA President Jim Hayes being honored for his work promoting FTTH. Hear FOA President Jim Hayes tell the FOA Story in a 2-part interview by Sound & Video Contractor Contributing Editor Bennett Liles. It tells about the FOA history, goals and achievements. National Fiber Optic Protection Summit: By the "811" group. March, 2008 in Vegas. There are tons of technical application notes and videos on the web, and occasionally we recommend some you should download. The JDSU fiber testing guide is really worthwhile, as are the ADC FTTx book and Westover video on fiber inspection and cleaning, linked below. JDSU offers a free download of their Testing Guide from the Lightwave website. This is one great book which explains some basic fiber technology, but the real value is the last half which deals with OTDR testing. Not only does it give the usual info, but it covers important topics like measurement uncertainties and anomolies like ghosts and gainers. 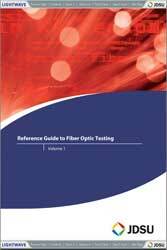 I was in the testing business for 20+ years at Fotec and think this book is one of the best fiber optic testing texts available. It's complete but comprehenisble! I used to believe that premises techs did not need OTDR training, but now OTDR manufacturers are pushing their use in premises networks. Unfortunately, the limitations of OTDRs in premises applications can cause extreme problems for those who are not aware of their limitations. So knowing hows OTDRs work is essential information to every tech. Westover has several application notes on inspecting and cleaning fiber optic connectors. The video is a big file (50+MB) but a good tutorial. We get many questions from CFOTs, students at FOA-Approved schools and others contemplating getting into the fiber optic business regarding jobs in fiber optics - and how to find them - so we’ve created a new web page to share some information we've gathered about jobs in our industry. The information is designed to help you understand what jobs are available in fiber optics, how to find them and apply for them. While the overall economy is pretty bad - you've probably heard that there are 5 times as many people unemployed in the US as there are jobs available, telecom is a bright spot - broadband is a major focus of stimulus spending in the US and countries around the world are building fiber networks as fast as possible. Even wireless companies have to build fiber for their backhaul. Cities are installing fiber linked surveillance cameras and smart traffic lights. Fiber is the link making Smart Grid possible. Companies like Allied Fiber are building large private networks. Telecom is one of the fastest growing businesses worldwide. If you are looking for a job in fiber optics, here is the FOA's guide to jobs. The FOA has created a group on expressly to help our CFOTs find employment and contracting opportunities. If you are a CFOT and are interested in participating, join us on . If you have job openings, let us post them on . 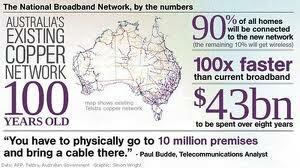 The federal government is spending 7.2 billion dollars on the Broadband Technology Opportunities Program. This money is working it's way into the economy and hopefully will provide jobs. You can track recovery dollars and look for job opportunities on this website: www.recovery.gov Go to "opportinities" link then "jobs". You will see a section “find recovery jobs” – enter “fiber optic jobs California” or wherever you are and review what comes up. In this position you will be responsible of designing, modeling, analyzing, and testing optical and electro-optical systems and components. In this position you will be responsible for development of laboratory prototypes, evaluation of their feasibility, the identification of their performance limitations, and the resolution of their technical risks. - Process skills required to design, model, analyze, and test optical and electro-optical systems and components, including sensors, lasers, fiber-optics, and photonics components. This position is based out of Hartford, CT area; salary range is totally based on your background, salary history and the interview process. Relocation will be provided to the right candidate. This is a direct hire full-time position with great benefits and looking to hire immediately. It looks like you may be a great fit for this opportunity, if not you may know someone. If you are interested in this opportunity, please send me your resume in MS Word I will contact you to schedule a time to discuss this opportunity in detail if you qualify. TSI is a ST. Louis Mo. Based company looking for a permanent job placement employee with OSP ribbon fiber, fusion splicing skills in Columbia/Jeff City Mo. area. The job is a Davis Bacon wage order job. Drug testing and commercial driver’s license required. If qualified please contact Randy Dinnella at 636-425-1369. FOA lists jobs and contracting opportunities on our LinkedIn group. CFOTs are invited to join. "We did great! We have over 15 interviews next week." "Your newsletter generated a significant number of applicants and we have filled the position." New FOA Swag! Shirts, Caps, Stickers, Cups, etc. The FOA has created a store on Zazzle.com offering lots of new logo merchandise. It has lots of versions of shirts and other merchandise with "FOA," "Fiber U," "Lennie Lightwave" designs and more so you should find something just for you! 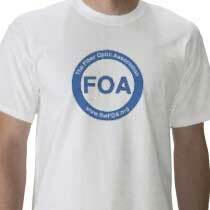 See FOA on Zazzle. The FOA CFOT and CFOS programs continue to gain momentum in fiber optics. Over 36,000 CFOTs (December 2011) have been certified by over 250 schools. Since our founding in July, 1995, we have dedicated ourselves to promoting fiber optics and professionalism in fiber optics personnel, focusing on education and certification. We are continuing to add new schools and more CFOTs as users of fiber optics learn that a CFOT is the indication of a professional, well-trained fiber optic technician. Now with FTTH (fiber to the home) finally taking off, demand for CFOTs is rising and schools are responding by expanding programs rapidly. The FOA now has approved programs in place at 200+ organizations, welcoming new additions like the Joint Apprenticeship and Training Committee of the International Brotherhood of Electrical Workers, Corning Cable Systems and AFL (and their new acquisition "The Light Brigade" for their installation training programs) and NASA's Goldstone Tracking Station. The complete list of FOA-Approved schools is at http://www.thefoa.org/foa_aprv.htm. Reading these will help you understand what each FOA certification covers and how to prepare for them. Your Name, CFOT® - It pays to advertise! The FOA encourages CFOTs to use the logo on their business cards, letterhead, truck or van, etc. and provides logo files for that purpose. But we are also asked about how to use the CFOT or CFOS certifications. Easy, you can refer to yourself as "Your Name, CFOT" or "Your Name, CFOS/T" for example. Feel free to use the logo and designations to promote your achievements and professionalism! Contact FOA at info@thefoa.org to get logos in file format for your use. Remember To Renew Your Certification ! Remember to renew your FOA certification. All current CFOTs have a ID Card with their certification data and we keep a database of current CFOTs to answer inquiries regarding your qualifications if needed. If you forgot to renew, use the online application form to renew NOW! You can now renew your FOA certification online - and get an extra month free. Details here. Want to write for the FOA Newsletter? Send us articles, news, anything you think might be interesting to the rest of the membership! (C)1999-2013, The Fiber Optic Association, Inc.